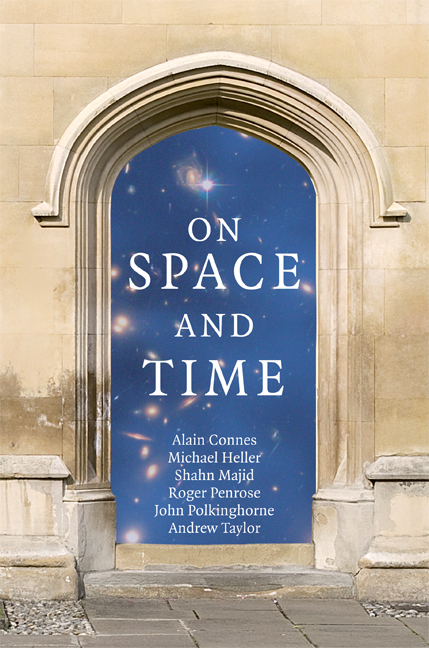 Some of Fields medalist Alain Connes‘ revolutionary ideas shed light on how to understand the ‘zoo’ of elementary particles thrown up by accelerators like the LHC. If Connes is right, the key to the fundamental nature of matter lies in graffiti carved on a bridge in Dublin in 1843. I am in Dublin later this week and will be taking my camera. So how does this answer the mysteries of the Universe? According to Alain Connes in his chapter of the multiauthored volume On Space and Time, spacetime indeed has ‘extra dimensions’ but these extra dimensions are not those of any usual kind geometry (curled up or whatever as in string theory) but something far more imaginative; they are given mainly by a symbolic algebra defined by this graffiti. Connes is a Fields medalist, which is like a Nobel Prize for mathematicians (who were left out in the will of Alfred Nobel. Incidentally, there is no merit to the popular myth that this was because of an affair between his wife and a mathematician; he never married). So what that means is that the actual mathematics behind his theory is very deep and very advanced; I’ll only be touching on the easier parts in this post. Well, lets get the maths over with. The main idea we need is that geometry is algebra. For example, one can think of a circle as defined concretely by an equation x2+y2=1 in terms unknown variables x,y. The solutions to this equation among real numbers form a circle. Similarly, working with an algebra of symbols x,y,z with the same properties for the symbols as ordinary numbers would have and with and additional equation x2+y2+z2=1 is equivalent to working with a sphere. Now, the first thing to note about the graffiti is that the symbol i, whatever it is, is the square root of -1. Of course, -1 does not have a square root among ordinary (real) numbers since the product of any such number with itself is positive. But in high school we learn that we can just add in such an ‘imaginary number’ with symbol i to obtain the ‘complex numbers’. They are used throughout the world by engineers and scientists. What Hamilton did was to throw in two more such symbols j and k. But the last relation ijk=-1 connects them. This looks innocent but after a little high school algebra you can deduce that ij=-ji. Oops. This is impossible for ordinary numbers: 3 x 5 = 5 x 3 and similarly for any two ordinary numbers (one says that ordinary numbers ‘commute’). So there could never be any usual kind of geometry described by variables i,j,k and the relations of the graffiti. This is why you need to be much more imaginative and imagine such a geometry even though it does not exist in any usual sense. You cannot visualise it as you can a sphere but you can work with the algebra — the quaternion algebra — as if a geometry did exist. It’s an example of a more general notion of ‘noncommutative geometry‘ as Connes puts it (or ‘quantum geometry’ is another term that I like). So, let’s take a copy of this particular noncommutative geometry, i.e a copy of Hamilton’s quaternions. Let’s extend the ordinary spacetime continuum so that at each point in spacetime you have sitting there these imaginary ‘extra dimensions’. They aren’t curled up, they cant be visualised in the usual way at all, but they are there. So what? Well, Connes now looks at the equations for wave-particles moving in such an extended spacetime and with the symbols i,j,k (and a bit more of the extension that I have glossed over) realised concretely as matrices much as in quantum mechanics. He and his collaborators find that each such wave-particle would appear to us as a collection of ordinary wave-particles exactly matching a good part of the zoo of particles found in particle accelerators. Is this a coincidence? This brings me to what is ultimately a philosophical point. What does it mean to understand something in fundamental science? 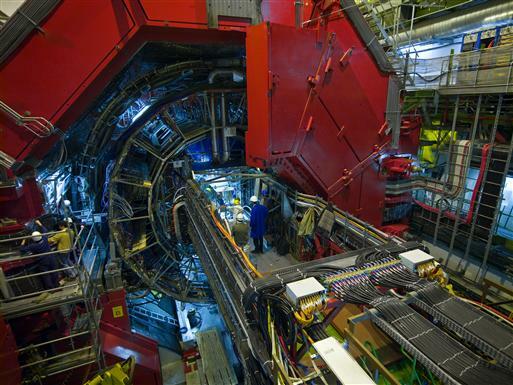 The point is that when you collide protons in a particle accelerator you get, in the collision fragments, a mess of all different kinds of particles — electrons, muons, tau particles, three flavours of neutrinos, various mesons and hadrons built from up, down, charm, strange. 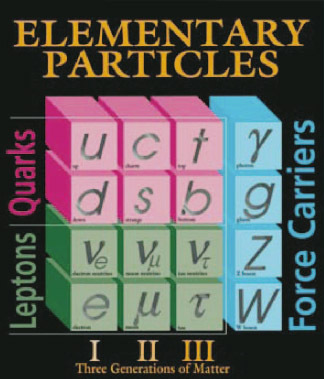 top and bottom quarks, and particles conveying three fundamental forces (not counting gravity). But you also get a theoretical mess. The well-established Standard Model of particle physics boils this down to some extent by identifying certain symmetries among the particles or if you like grouping them together. But as Connes likes to point out, it still takes a page of complex and disconnected formulae and more than two dozen unexplained parameters to write down this standard model. The reason its called the ‘standard model’ is because it’s survived more or less unchanged since the 1960s. So the philosophical question is: is nature messy or should particle physicists try harder? Should we be content as zoologists naming and classifying or should be look for a deeper and simpler layer of science as explanation? 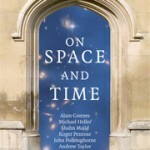 It is certainly true that physicists made some attempts to further ‘unify’ their understanding of particle physics (so called grand-unified theories) but many of them gave up in the 1980s and 1990s to spend time on more fancy things. It means that we are no closer to understanding basic things like why electrons and protons etc weigh what they do or why elementary particles fall into three families as they do, among many other mysteries. But put in the right pure maths and it all starts to make sense. At the moment Connes’ theory is not accepted in mainstream physics, but this could change if his current prediction of 168GeV for the mass of the Higgs particle is vindicated in the LHC. More important for me is that this is a new geometrical point of view on particle ph ysics that is much more economical and constrained than conventional extra dimensions — if we fully understand that geometry (which Connes encodes as a ‘Dirac operator’ but which you could think of as such things as curvature or gravity partly in these ‘noncommutative’ extra dimensions) then we have a route to understanding all the parameters and structure of the zoo completely.